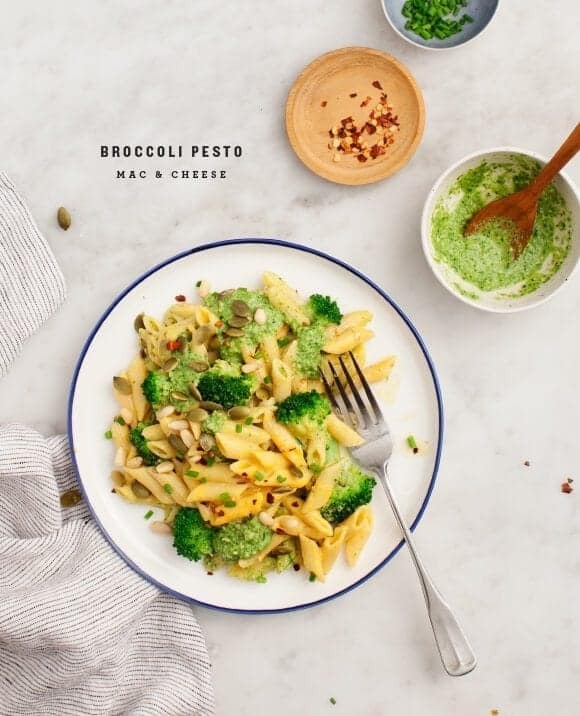 The ultimate mac & cheese mix in - broccoli pesto! A yummy way to get your kids to eat more veggies. Some exiting news – the book is done(!) and off to print this week. I’ll share some sneak peaks a little later but suffice it to say – I’m tired. I never thought I would say this but after shooting, testing, retesting, checking and rechecking so many recipes – I became a little “cooked” out. Over the last few weeks, while working through final copy and design edits, there’s been a lot of takeout around here and more than a few boxes of macaroni and cheese. But no one is complaining – especially not my mac & cheese-loving husband Jack. He would be more than thrilled if every night was mac & cheese night! I make my broccoli pesto with blanched broccoli florets, basil, and pepitas. 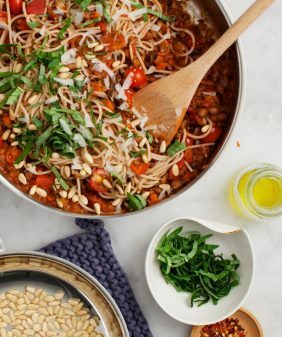 You can use pine nuts or walnuts if that’s what you have on hand. I love making pesto with pepitas because they are inexpensive, and they make your pesto a very vibrant green color. This pesto recipe makes extra, so you can either save the rest to mix into your mac and cheese again the next night, or slather it on your eggs & toast the next morning. 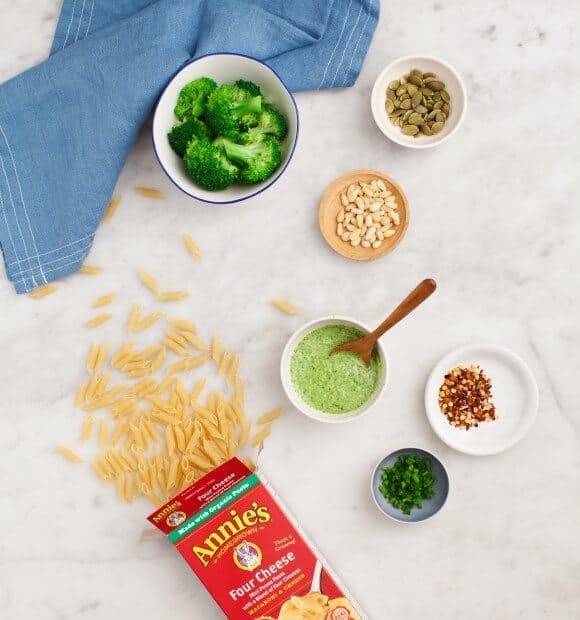 We’ve always been a big fan of Annie’s products – their Four Cheese Macaroni and Cheese is made with organic wheat penne pasta, and only high-quality non-GMO ingredients. Not to mention, it’s so creamy and delicious. What do you like to mix into your mac & cheese? Share a photo on Instagram of your favorite “mix in” creation and hashtag it #mixinmonday. Prepare a large saucepan of salted boiling water and a large bowl of ice water. Drop all four cups of broccoli florets into the boiling water and blanch for 30 seconds to 1 minute, until slightly tender but still vibrant green. Remove and immediately place immerse into the ice water for 1 minute, then drain. Make the pesto: In a food processor, combine 2 cups of the blanched broccoli with the pepitas, basil, and garlic. Pulse until combined. Add the lemon juice and a few generous pinches of salt and pepper and pulse again. With the blade running, add the olive oil until the pesto becomes smooth. Taste and adjust seasonings. Set aside. Rinse the saucepan you used for the broccoli, fill it with fresh water, and bring to a boil. Add the pasta and cook 8 to 10 minutes, or until al dente, stirring occasionally. Drain the pasta in a colander. While the pasta is draining, add the milk and butter to the warm saucepan. Sprinkle the cheese over the milk and stir to combine. Add the cooked pasta to the saucepan and stir well. Stir in the remaining 2 cups of blanched broccoli florets until the broccoli is warmed through. Stir in a few scoops of pesto. Serve with extra pesto and optional toppings on the side. Store extra pesto in the fridge for 2 to 3 days. tip: for a lighter pesto, sub half the olive oil with vegetable broth. This post is sponsored by Annie’s Homegrown, which we love. Thanks for supporting the sponsors that keep us cooking! Annie’s is the only boxed mac and cheese worth eating. I love the idea of adding broccoli in two forms. 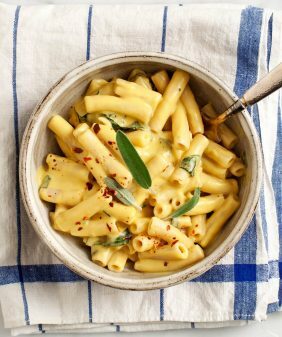 I’ve never tried adding any type of pesto to mac and cheese, what a great idea! I absolutely love your blog, and I am so excited to purchase your cookbook! 🙂 I do not grow fresh basil at home, and the fresh basil in the supermarket seems very expensive (I need to check out my local farmer’s market). This might be a ridiculous question, but is any way to make dried basil work in the broccoli pesto? Hi Caroline, thanks!! 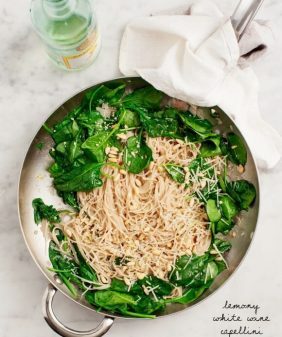 I wouldn’t use dried basil, but I’ve used spinach here when I didn’t have fresh basil, or a mix of spinach with parsley or cilantro (basically any leafy green or soft herb I might have around). Adjust the flavors to taste since those things aren’t as sweet as basil (sometimes a little more lemon, sometimes a drop of honey). Or in a pinch, I would just skip it! Looks so good! Would love to have a lactose free version as well but I guess that is hard if using annie’s pasta. Stunning photography as always and congratulations on your book being finished! It must feel so exciting and rewarding! ah this is amazing news! gotta try it, thanks for the heads up! Recently became vegetarian and eating better so this was perfect!!! I used vegan cheddar/jack cheese and veggie noodles instead and it turned out flawless!! So excited to finally have Mac n Cheese back in my life!! It looks delicious! I especially love the colour the broccoli adds. thanks! yep, it really wasn’t heavy at all! I love how pesto gets all caught up in broccoli. It’s just a little bit decadent, but at the same time, it’s broccoli. Wow, I’m a nerd. But this looks great! Congratulations on fishing your book! What a great feeling that must be. And I love making broccoli pesto but hadn’t thought to combine it with mac & cheese. 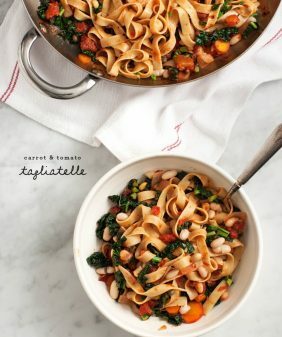 Awesome cold weather pasta dish! This is my go-to on a lazy dinner night. Annie’s Mac… dressed up. I roasted some asparagus the other night and threw it in there. Total win. First I want to congratulate you for finishing your book! 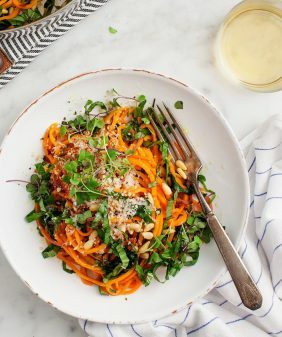 Then to share that I am absolutely in love with this recipe, but I think I will add some feta cheese in the pesto, because my whole family are huge cheese fans :). Great work and I am hoping that you are having an awesome time after your accomplishment with the book. Thank you for sharing this, it looks delicious! 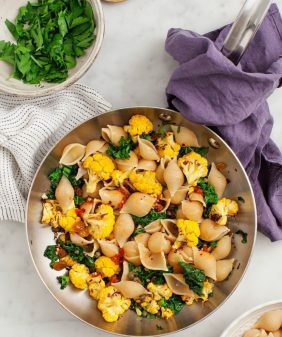 I love how versatile mac & cheese can be, and I feel as though broccoli is such an underrated vegetable…Its nice to see it used in such a great and unique way! Yummy! This looks like a great easy dinner. Congratulations on the book, can’t wait to see it.